Scoop’s Summer of Love Rant. Can you dig it? Put some flowers in your pipe and journey back 50 years to when the world was young. The Summer of Love. 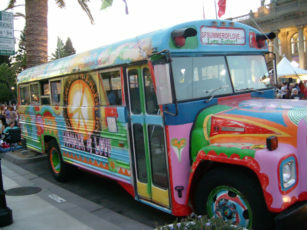 A bus full of laughing hippies takes idealistic flower children to frolic in the sun. Savor the world and have another toke. Celebrate the age of Aquarius. Experiment with consciousness while ingesting illegal substances all while sporting a wild looking Jew Fro. A counterculture born by rejecting the old world mentality of our parents. A spiritual revolution. Erect a statue of the unknown hippie as they had it right – It’s time to simplify. We sure could use a Summer of love right now! Let go of the greed and fear and have yourself a be-in. Stay high but keep your priorities straight.